Metabolomics, a detailed analysis of small molecular compounds in biological samples, is a strong tool as mostly all the biological phenomena result in changes in an organism. There are multiple outlooks to probe the metabolome through metabolic fingerprinting, metabolic targeting and metabolic profiling. The upcoming field of metabolomics in recent years tends to profound its wide applications in the field of drug discovery and drug development while data analysis for metabolomics typically consists of feature extraction, statistical analysis, compound identification and biological pathway analysis. The Thermo Scientific™ suite of metabolomics software products allows you to quickly transform complex data into useful results. With recent advancements in the field of metabolomics it’s proved to be a major tool in the process of drug discovery and development. In the agricultural/chemical industry, metabolomics may be used to develop herbicides and pesticides. Goldstein Research analyst forecast the Metabolomics market size is set to reach USD 2.1 billion by 2024, at a CAGR of 11.3% over the forecast years. With increasing importance being placed on health and safety related aspects of food, metabolomics can potentially be a valuable tool to monitor and improve the quality of what we consume. 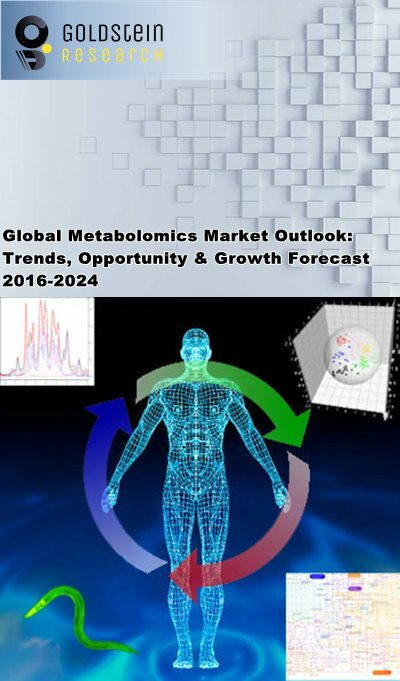 The report covers the present ground scenario and the future growth prospects of the Metabolomics market for 2016-2024 along with the data of sales of total number of metabolomics based products & services worldwide. We calculated the market size and revenue share on the basis of revenue generated from major players across the globe. The metabolomics market is forecasted on the basis of revenue analysis, product benchmarking and strategic developments of key market players. Based on application, biomarker & drug discovery industry dominated the global metabolomics market attributed to largest market share of 30.1% in 2016 owing to its advances in metabolomics technologies and its implications to diagnose disease, understand disease mechanisms, identify novel drug targets, customize drug treatments and monitor therapeutic outcomes. Personalized Medicine is the fastest growing application with the CAGR of 11.5% over the forecast period and tends to lead in future due to the capabilities of metabolomics which impacts scientific and biomedical fields. Metabolomics Market Outlook 2016-2024, has been prepared based on an in-depth market analysis from industry experts. The report covers the competitive landscape and current position of major players in the global Metabolomics Market. The report also includes porter’s five force model, SWOT analysis, company profiling, business strategies of market players and their business models. Global Metabolomics market report also recognizes value chain analysis to understand the cost differentiation to provide competitive advantage to the existing and new entry players. Our global Metabolomics Market report comprises of the following companies as the key players: Agilent Technologies, Inc., Thermo Fisher Scientific, Inc., Bruker Corporation, Danaher Corporation, Shimadzu Corporation, Metabolon Inc., LECO Corporation, Biocrates Life Sciences AG, Human Metabolome Technologies, Inc., Waters Corporation, Phenomenome Discoveries Inc., Metabolon, Agilent Technologies, Bruker Corporation and Human Metabolome Technology. According to the report, major driving factor is improving the route from early drug discovery through clinical development as drug discovery is risky and complex process with just 12% of drugs entering the clinical trials ever to make it to the patients. With the availability of wide range of tools from genomics to structural biology to rational drug design technology not only provides data that drives better decisions in the pharmaceutical research and development world, but also has the potential to re-shape how medicine is practiced in the 21st century. Further, the report states the biggest challenge, and one seen across precision medicine approaches, is how to provide actionable information to the physician from all the big data generated by multi-omics as extracting the information and interpret it in a biological context from the vast amount of data produced by high-throughput analyzers has not seen much of the evolution. Based on geography, North America dominated the global metabolomics market with the market share of 37.5% in 2016 owing to increasing research and development activities in functional genomics, nutrigenomics and toxicology and the presence of a large number of leading metabolomics manufacturers. Europe is the fastest growing metabolomics market with easy accessibility to technologically advanced products. APAC is the opportunistic metabolomics market owing to increasing prevalence of diseases like cancer, cardiological disorders and inborne defects. What is the revenue of Metabolomics in 2015-16 and what would be the expected demand over the forecast period?